Betcha didn't know that the Four Preps' classic "26 Miles" was written on a uke! And on July 15, on Catalina ("the island of romance, romance, romance, romance..."), you and your uke can join in celebrating the 50th anniversary of this beach classic. July 15, 2007, there will be a concert at the Descanso Beach Club featuring the New Four Preps (including the original lead singer and uker Bruce Belland! ), during which there will be a strum-along performance of 26 Miles. More information about the concert and tickets can be found at the Catalina Island Museum site. And before you go, you can learn the song, along with additional ukulele-themed lyrics by Belland, in Jumpin' Jim's Ukulele Beach Party. So lovers of the world unite! A Canadian collector's Martin instruments, including a nice range of ukes, all lovingly photographed in this Flickr photoset. If you're a true Martin fan, you'll want to make this gallery of Martin headstocks your desktop image! Robert Wheeler showed up with ukuleles and beer and we sat in the back yard with the cats, cherries and my daughter Zoe, who helped me test the sonic capabilities of some of the ukuleles. Robert describes the luncheon ukuleles thusly"...a simple thought, "bring ukes (early) that have slotted (as opposed to (latter) itty bitty drilled holes) wooden pegs, to lunch." ...... Four have labels, one doesn't. Should be a piece of cake to ID the damn things. The Martin flesh searing stamp ....... busy S,S, Stewart blue paper .....triangular Sammo head logo and artful paper, brown tones, label ....... the simple early white Supertone, maker not identified (this is not helpful) ......... and then, in attached pics, on the left, no ID ........ but familiar head silhouette ....... on two of my wall hangers, a 30's "elaborate" blue Supertone label and one with "Winner" trade mark on head ... which doesn't help tell us who, were ....... as ...... according to the King, this mark is for Manhattan Band Instrument Co. Inc. (who also has uke marks .."SUPERUKE" (Look!! Up in the sky!!!!) - "FOURLEAF CLOVER" (Ukes for the Irish Ukulele Festival) .... and sensing that MBI Co, didn't make the thing ........ as 19th Century music business practice .... "...... Many music stores, large and small, were able to order a quantity of instruments from major manufactures (Conn, Buescher, Holton, King, Martin, York) with their names inscribed on the ...." (Ditson being a example that we all know and love...)"
It's ukulele season in Gotham, so come to Mo Pitkin's Saturday night for another installment of Ukulele Noir to see some of the city's most unique uke performers. Craig Chesler will be filling in for Craig Robertson as Emcee, playing a set, and sharing the stage with Nightcall, Sweet Soubrette, and Meaghan Farrell. Nightcall is retro revivalist (& Moonlighter) Bliss Blood's latest project. Playing her trusty ukulele, Bliss is accompanied by Peter Maness on upright bass and Stu Spasm on electric guitar. They play 1960's film music (think 007) and originals in the style of "crime jazz." Sweet Soubrette brings a fresh new voice to the singer/songwriter scene with a femme-fatale-and-ukulele act that walks the narrow line between ironic and sincere. Tongue-in-cheek lyrics and melodrama notwithstanding, these torch songs just might be in earnest. Sweet Soubrette is Ellia Bisker on vocals and ukulele. Meaghan Farrell is a young singer/songwriter from Jersey who has been stunning audiences in New York and Boston with her original compositions. "A statue from 1939 Treasure Island Fair, by Adaline Kent, "Young Boy with Ukulele"." A warm night in Ukuleletown. Out in the back yard hot breezes are blowing through the leaves of the cherry tree. The cherries aren’t quite ripe yet, but they will be in a week or two. The cherry tree bears fruit every two years. Every two years. You have to take the long view if you want cherry pie from my back yard. So in the meantime make some music. Pick up your (cheap, custom, vintage, new) ukulele and make some music. It’s dark and down the street a Portuguese couple is fighting or making love, dogs bark tiredly and the grasses rustle with small creatures. It’s all music. Make your own. That's why you have a ukulele in your hand: to make music with. Not to make money, not to get famous, not to improve your social life...but to make music. All those things are nice if they happen...but right now you can make music. You can always make music. The next afternoon the sun is shining through the livingroom windows. Robert Wheeler shows up with beer and ukuleles. Davis Sweet shows up with a hat and two ukuleles. We’re tradin’ songs and makin’ music. In Ukuleletown, this is what happens in the afternoon when it’s quiet and the Portuguese lovers are sleeping, the dogs are sleeping and small creatures are burrowed deep in the warm earth. “Harp Ukulele” – the name alone seems a contradiction in terms. Yet once upon a time in America, this unlikely hybrid (or perhaps “variation” is a better word) was dreamt up and produced by not one, but two, unique individuals – separately and in completely different forms....."
All systems are Go-Go for this year's edition of that rum-infused lost weekend of Paradise-Pop, Tiki Oasis. This year it's August 16-19 in San Diego at the Crowne Plaza Hotel. But don't let that bland chain hotel name fool you, it's the former Hanalei Hotel, awash in Polynesian pulchritude. Of special interest to uke players, Judd Finkelstein, aka Iuka Grogg, and leader of the Island of Napa's own Maikai Gents, will be hosting a ukulele jam session (aptly titled Iuka Grogg's Ukulele Fantasy Camp). The jam is on Sunday, August 19, 2007, in the atrium of the Crowne Plaza Hotel. No cost, just bring your uke. Complete information about Tiki Oasis 7 is at the following link, including reservation and schedule deets. Bring your rubbah slippahs and your go-go boots! This month’s episode of Alternate Tunings will be a little different than what you’re used to. Our crew has been out of town on special assignments so in lieu of an episode on a unique and unusual musical instrument this show will be the “All Ukulele Minute Edition”. Songs culled from past episodes along with new material. My special guest host for this show is Miss Kitten on the Keys and if you don’t already know and love her you will by the time the show is finished. That’s this Wednesday, June the 20th at 9:00am West Coast Time on KALX 90.7 FM in Berkeley. Don’t miss this one. And for those of you out of our viewing range KALX has a live web stream at "
There's a discussion thread on The Fountain Pen Network right now about ukes. 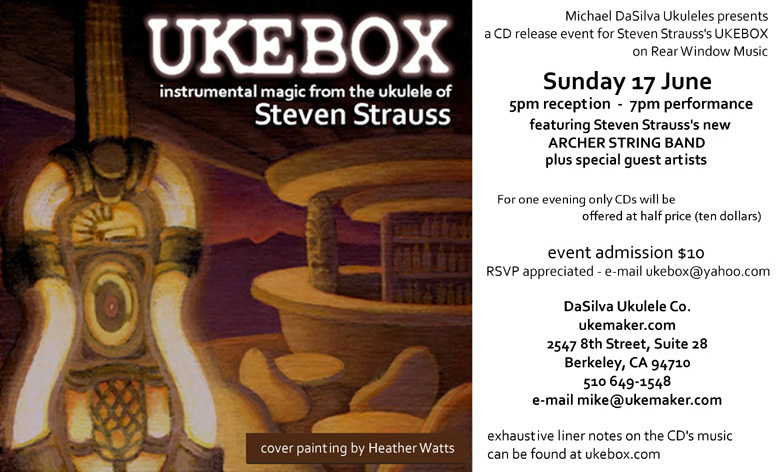 One poster has noted a parallel between Pen Collecting and UAS, aka Ukulele Acquisition Syndrome. This must be true, because I'm a fountain pen fanatic myself. A few days ago we blogged about Hailey Wojcik, a former Lansing, MI uker who has taken her act to the Big Apple. Hailey promises there'll be some new song on her MySpace page soon, perhaps even some music videos, too. Rock on, Hailey, and break a leg tonight! Big show. Don't miss it. I think I heard Lucinda, she was cryin' in the rain. A rainy night in Ukuleletown. Lean against the brick wall outside Louies. Close your eyes and listen… yeah. Whattaya hear? Plunk, plunk, plunk. Raindrops? Someone pickin’ on a ukulele? More like it. But it’s mean and growly, kinda dirty…like someone ran the sound through a meat grinder. ‘cross the street there’s a window with no curtains. Light so bright it all seems black and white. Man playing ukulele through a small amplifier. East Coasters will want to check out the 5th Annual Mid-Atlantic Ukulele Invitational (MAUI) this weekend in Annapolis, MD. Complete details here. Santa Cruz ukers Donna and Peter Thomas made the front page of the SF Chronicle this morning with a story about their trek which retraced the footsteps of John Muir on his hike from San Francisco to Yosemite. 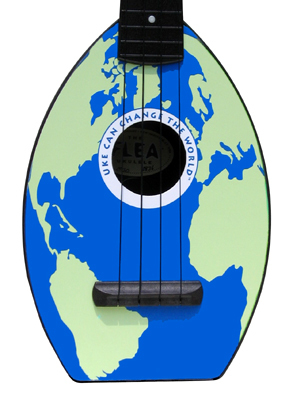 Here they are near the beginning of their journey, kicking it off in due form, with ukes. I don't believe they took ukes with them on the trail. We'll give them a pass on that, since Muir, hiking in 1868, would not have had one. They're writing a guidebook about their trip. 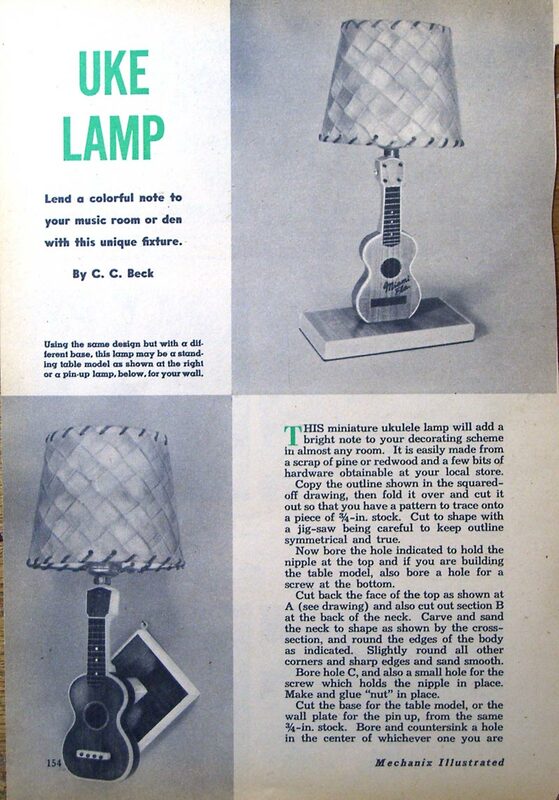 Let's hope it comes with tablature. And that no ukuleles are harmed in the process.